higher tension on rigid loads such as bricks, timber and textiles. 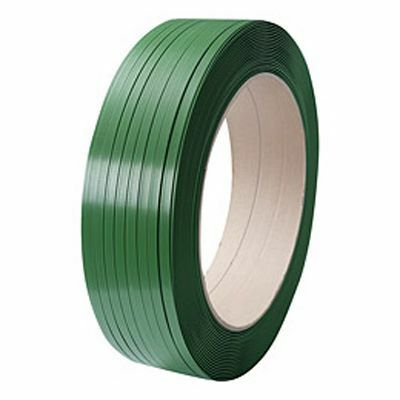 Extruded Polyester Strapping is also safer to use than steel strapping as it does not have sharp edges or present a whiplash hazard. 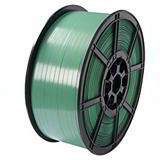 And with three times more strapping per reel than steel, polyester makes a viable, great value alternative. The inherent features of polyester also provide many additional benefits over other strapping products. It is lightweight, supple, easy to handle and will not rust, scratch or stain your packaging products. Supplied on 406mm diameter x 150mm wide cardboard core. Polyester strapping wound onto a cardboard core can also be used with automatic and semi-automatic strapping machines. Polyester Strapping Dispensers - for maximum portability and ease of dispensing. 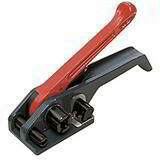 Polyester Strapping Tools & Sealers - for speedy, efficient strapping. 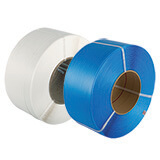 Polyester Strapping Seals - for safe and secure sealing. Plastic Edge Protectors - to minimise corner damage of tightly strapped products.